At the end of my research trip for the upcoming Rough Guide to India I took a flight from Lucknow to Singapore with Scoot. Scoot is a Singaporean low-cost airline and an arm of the Singapore Airlines Group. It’s one of the Top 10 World’s Best Low-Cost Airlines as voted by SkyTrax, and merged with Tigerair in 2017. Flying to 66 destinations across 18 countries (including a range of Indian cities, like beautiful Amritsar), Scoot is rising as a valid alternative to other regional giants like AirAsia and JetStar. It is also worth noting that Scoot is the only Southeast Asian low-cost carrier operating flights to Lucknow, the capital of Uttar Pradesh state. We had used Scoot before to fly from Athens to Singapore and Penang to Singapore and had a very positive experience. We can certainly say the same of this direct Lucknow to Singapore flight. To be honest, the international terminal sees only a few direct flights from Lucknow daily and is fairly small for a major city. Upon arrival, we had delays because the Indian eVisa immigration desks were not functioning properly, and we kind of expected some sort of delays even on the way out. Luckily, stamping our passports out of India was a quick process with no questions asked. What was a bit cumbersome, and not because of Scoot’s ground operation staff, was checking in our luggage — two simple 40 litres backpacks, on top of the small carry-ons we have for our electronics (cameras and laptop). At Lucknow airport, you have to security scan your bags, which are then secured with a sticker on top of the bag’s main lock. Since our backpacks had rain covers for protecting them against potential water damage, we had to wait close to 20 minutes because the airport’s staff could not figure out a satisfying way to tag our packs. Even with this delay, Scoot’s ground operator at Lucknow was calm and friendly throughout the whole process, and soon we were across the final security check and seated in the departures hall waiting to board our flight. Don’t expect luxury here, as Lucknow airport lacks major facilities, and food options are quite basic. When the time came to queue up for boarding, we stood in line for one last passport and boarding pass check before we were ushered into a bus and dropped next to the aircraft. On the contrary of the very comfortable Boeing 787 Dreamliner we used when flying Scoot from Athens to Singapore, this was a smaller Airbus A320s. Absolutely fine for the flight, even though on distances of this range (about 5 hours) we prefer a bit more of cabin space in case we wanted to walk around and stretch our legs. Scoot’s flight from Lucknow to Singapore leaves Terminal 1 at 7.50pm, arriving at Singapore’s Changi Terminal 2 at 3.35am. Our seats were in the middle of the aircraft, next to the security exits, and hence we had quite a bit of comfortable extra legroom. One of the air stewardesses kindly explained to us what we should have done in case of emergency landing and evacuation, and we agreed to help. Soon after we took off with a slight 15 minutes delay. Less than an hour into the flight, we received the in-flights meals we had pre-booked. I had rice with chicken and mushrooms in a thick sauce, served hot, a pretty good meal. The meat itself was well cooked and above the standard of other low-cost airlines whose food I tried before. I washed it all down with a coke and had a complimentary Ritzer chocolate bar with crunchy nuts included. Before I fell asleep for a few quiet hours on the way to Singapore, the stewardesses, better known as “Scotees”, made a couple of rounds to either sell drinks (not included in the cost of the flight) or make sure that safety belts were fastened whenever the aircraft encountered small turbulence. 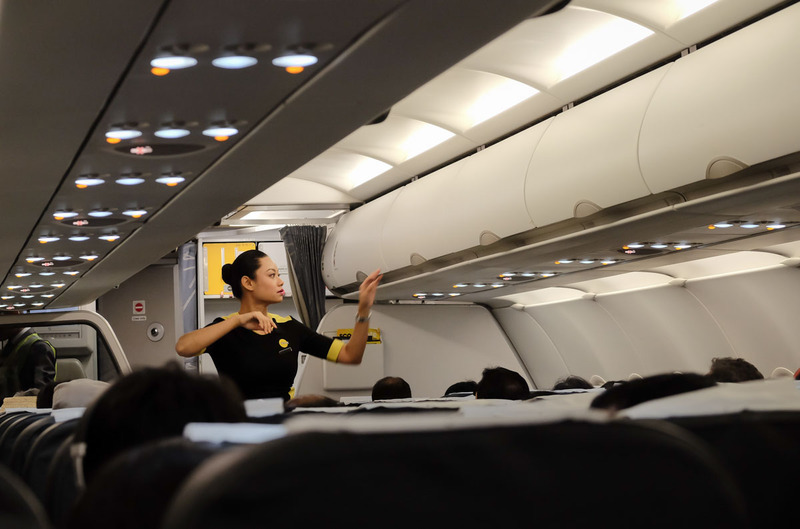 It was an uneventful flight and I managed to sleep decently, as Scoot seats are well padded and can recline low enough to give your back a decent incline. Landing in Singapore was smooth, and by the time we arrived, we had recovered most of our flight delay. As we had an onward connection to Penang in Malaysia a few hours later, we remained in Terminal 2 without going through Singapore’s immigration. Changi Airport in Singapore is quiet enough to sleep decently, either on one of the chairs, or using an inflatable mattress to lay on the floor and catch a bit of shuteye. Lucknow, the capital of Uttar Pradesh, is a sprawling metropolis and quite busy, too. It was once a paradise of Mughal architecture, considered a “ Paris of the East” by travelers and explorers of old. These days, not much of that bright heritage is left, and still what remains makes up for the best place to visit in Lucknow. 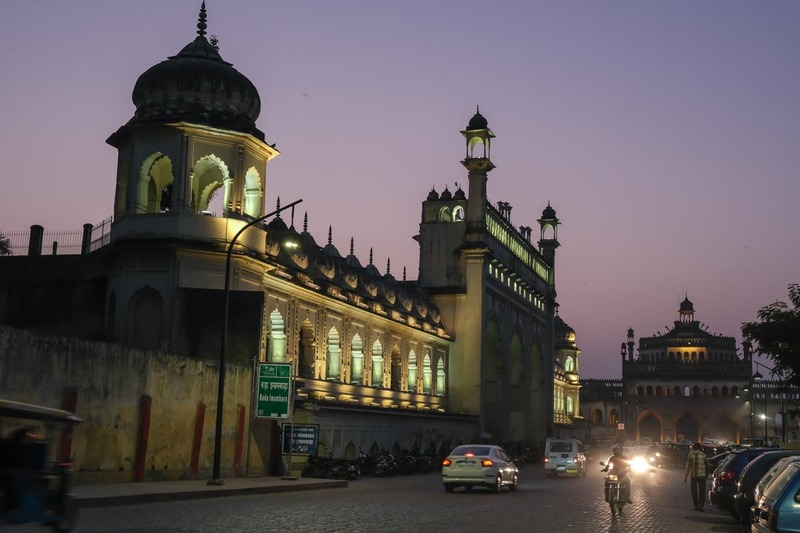 Night view of the Bara Imambara from outside the wall fortification (image by Kit Yeng Chan). Inside the Bara Imambara is a very relaxing and well-manicured garden that anyone should go visit before taking their Scoot Lucknow to Singapore direct flight (image by Kit Yeng Chan). We recommend you visit the northwestern side of the city centre, right north of the Chowk district and at the side of Pukka Bridge. That’s where the Teele Wali Masjid and the Tomb of Shah Peer Muhammad are. 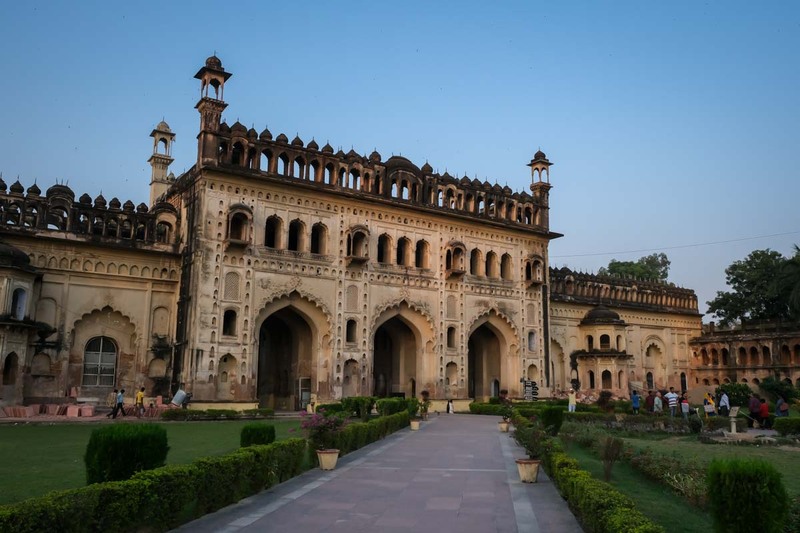 Take a look here and then cross the road and go to the Bara Imambara, Lucknow’s most striking site: go inside a garden closed by high walls decorated with domes and turrets, and have a feel of what the greatness of Lucknow once was. Most of the city’s buildings, in fact, were styled to fit the grand architectural vision of monuments like the Bara Imambara. Just outside to the left of the Bara Imambara’s main entrance is the Rumi Darwaza, the remains of a gate that gave access to the city in the past. It stands tall, a fortified wall with two bastions at its sides set next to the gate itself. 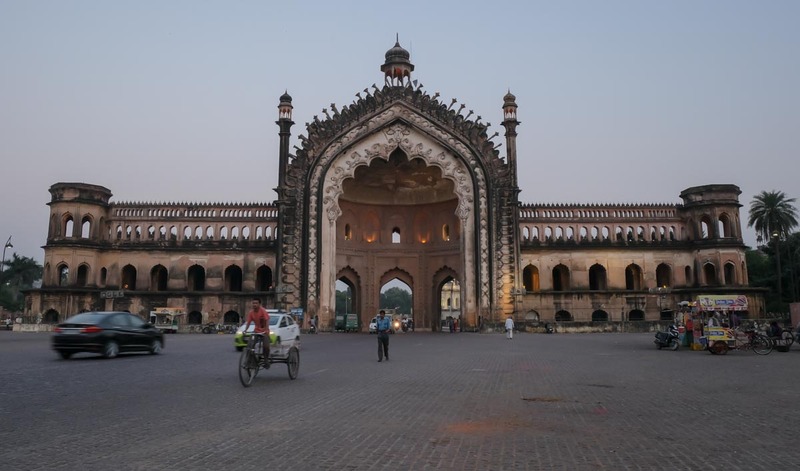 You must take a rickshaw to cover the kilometre-plus distance to the Hussainabad Imambara and Jama Masjid, the two last exquisite monuments of this old scenic part of Lucknow. Food-wise, Lucknow surprises with its meats and kebabs: try the special Tunday Kababi, especially those made with buffalo meat, and enjoy delicious muttons and chicken biriyanis. Sprawling Lucknow has a new metro system that, at the time of writing this post, is not reaching the airport as of yet. The closest metro station is at Transport Nagar, two stops away from the future airport metro station. You can travel here from the Charbgah Metro Station in the centre of town, and take an auto or a Grab Car to the international departures terminal, which should cost in the range of INR100-200. Hailing a Grab at the airport itself comes cheaper than taxis: we traveled from the airport to the northwest of the city, near Lucknow University (a 30km ride) for INR 400. Be aware that, if arriving at the bus terminal at Alambagh (common if arriving by bus from Agra or Prayagraj), autorickshaw wallah may propose extortionate amounts just because you are a foreigner/traveler – yes, it happened to us. If you need to move to the city centre, your best bet is riding the metro for two stops up to Charbagh, and then pick up another rickshaw or Grab Car from there. Our flight from Lucknow to Singapore was perfectly uneventful, besides a small delay of 15 minutes which was recovered during the flight. Food was of a good standard for an airline, and the additional chocolate bar a good treat. We did not purchase any in-flight entertainment, but we know that wi-fi service is available at a cost. 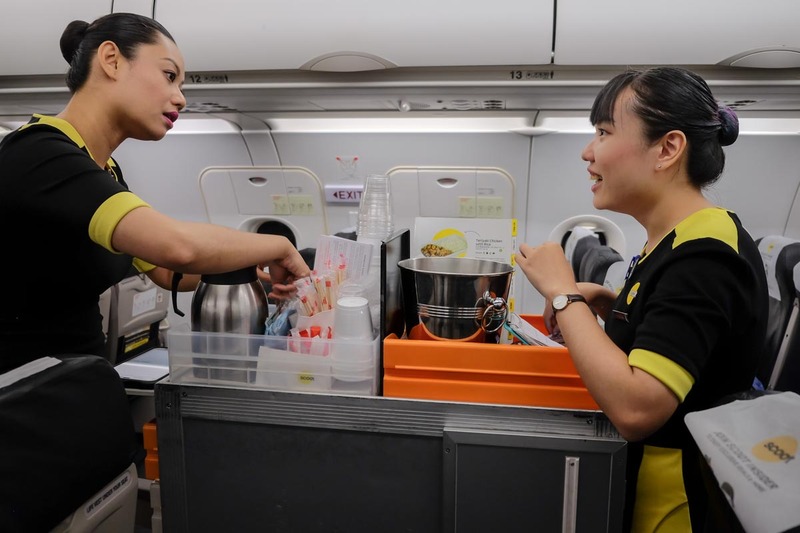 The flight attendants were attentive and made their best to accommodate passengers’ requests — not something you always see done efficiently by most airlines. All in all, for a 5 hours flight we would prefer a slightly bigger aircraft, but Scoot Airbus A320s proved to be comfortable and landed in Singapore on time. We would definitely fly again with Scoot, and think you should consider their routes Singapore to India, which include, besides Lucknow, Amritsar, Bangalore, Hyderabad, Kochi, and Tiruchirappalli. Disclosure: Scoot sponsored our flight from Lucknow to Singapore, but all the opinions expressed in this review are solely our own. We would never recommend a company or service we don’t endorse fully or wouldn’t use ourselves (we certainly paid for Scoot in the past). You can trust our judgment, which is always independent and based on personal opinion and experience. WANT TO BE UPDATED ON OUR DISCOVERIES ACROSS OFFBEAT ASIA? SUBSCRIBE TO OUR MAILING LIST.